Being from the Midwest (St. Louis) I am used to the brutal winters and suffocating summers. As we are currently dead smack in the middle of one our worst winters in a long time I find that my hands are suffering the most. Being a stickler for beautiful hands I wanted to share a few tips and tricks to maintain healthy hands during the deadliest of cold. During winter we tend to spend more time indoors, than we do outdoors. Unbeknownst to most, the time we spend inside during winter months can be just as damaging as battling the elements. The heat in our homes and workplaces dries out the air which soaks up any moisture our skin may have left. 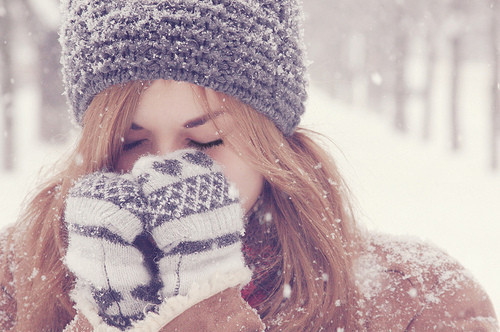 Our skin is naturally dry in winter months, when possible use a humidifier to restore the skins moisture. Hand washing during winter months is key to killing those pesky germs that cause sicknesses such as the flu from setting in. Just like that moisture stealing inside heat, constant hand washing reaps havoc on your hands. So how can you combat the inevitable? Don’t wash your hands? Of course not! Use cool or lukewarm water and a mild soap. Pat dry your hands and immediately moisturize your hands to replace what was lost. Lastly, wear gloves. I’m sure you’re like “Duh B”. But you would be surprised to learn how many women [and men] go outside in winter without gloves. Dry, cracked skin is no fun, especially when working with your hands all day. In closing, moisturize, moisturize, moisturize! Your skin will tell you when it needs to be replenished you just have to pay attention. I am a huge fan of “African Shea Butter” year round but especially during extreme cold or heat. Another great product for intense moisture is “Carmex Healing Cream”.